Once formalin is mixed up, at 1 ml per gallon for prophylactic bathes, how long is it stable or good for? For example , if I mix up 5 gallons of saltwater with 5 ml’s of 37% formalin, and I dip 2 fish for 30 minutes, can I remove that fish and immediately place in another fish in that same aerated , heated water? From the time it’s mixed, to the time the second batch of fish is done, the formalin would have been mixed up for less than two hours. Your trust is correct, I have that Guerrilla acclimation piece bookmarked. If I am allowed to be confused for a second, you say to use freshwater as opposed to salt. If using formalin at that rate, in freshwater, how long can fishes stay in freshwater with the aforementioned formalin? Was under the impression freshwater dips can go 5 minutes, 10 minutes max, where the formalin needed more contact time than that? Thank you bob, for this and all you do. Moral to the story, rather than use a stop watch and time it, let the signals the fish give dictate the length of the dip. I feel very confident on my qt protocol I’ve established. Prophetically treating for the known enemies, with the formalin dips, copper for at least two week before being moved into a sterile , clean observation tank, with Praziquantel and Metroplex to cover the plethora of evil enemies. My fear is, now, when adding pieces of coral. With the majority of the fragments coming from tanks already harboring fish (most likely fish parasites too) placing them in my tank, hoping they do not have fish nasties in them . I’m a few months away from that, so my next step in all of this is to research a type of coral dip , one that not only kills Acro pests, such as aefw, red bugs, etc, but also give me some comfort of biking potentiometer fish bugs as well. Assuming the Bayer insecticide I will be using for aefw doesn’t kill fish parasitic organisms, perhaps using metrostanizole (sp?) , which is supposed to kill brook and Uronema, or maybe hydrogen peroxide, to potentially kill some ich or velvet spores. Open to suggestions , I know the right way is a quarantine fallow period for corals with no fish, however I even sold the piggy bank in order to put led’s on my main tank, can’t afford a separate system that could properly handle sps. Lastly, what do you make of the Indo ban? Was this a long time coming, and an accurate barometer on the fish populations in the oceans? Or just political entities flexing their muscles? Was thinking metro in a bath, the 20-30 minute variety, doesn’t sound long enough. Iodine...have never used this before , will have to research the in’s and outs. Hopefully it’s pretty straightforward. Hopefully the Indo mess resolves itself sooner than later. I know of a couple lfs here in NJ who are considering converting their holding/for sale tanks into freshwater. I am sure this has hurt many collectors/exporters. Would you happen to know any places that have 37% formalin? The quick cure I have from Mardel/fritz states it’s 17.5 percent formalin. From everything I’ve read, that’s not enough. I suppose if I double the dose, that would yield me the necessary formalin product, but would also double my malachite green percentage (states it has .42 percent malachite green) not sure if doubling the amount would result in too much malachite. Thanks bob. I did call around the area and not one was willing to sell it or have any motivation to tell me where to get it. The stuff I have is 18.5 percent formalin, ad .44 percent malachite green. Would this be too much malachite green in your experience? I did call two, the first said they wouldn’t deal chemicals to the public, second one asked why I was needing to obtain it, when I began my rant, she interrupted and said she couldn’t help me . I live in New Jersey, a very regulated state, perhaps they don’t want to take a chance . You telling me it is too high is all I needed to hear. I will see where else online it might be had. Is it true that fish exposed to formalin dips only have a life expectancy of 2 to 3 years. Looking at some message boards there seems to be people advising that there is anecdotal evidence that this is the case but it just seems to be people throwing stuff out there without any scientific proof. Just wanted to get your thoughts. Thanks Bob. In your opinion is dosing 1ml per gallon in a bath for 30 minutes or so more dangerous than 2 drops per gallon done in a QT tank three days in row? I have used both effectively. No clear cut answer, many similar but nothing black and white. If using rid ich (4.2 percent formalin), for immersion bath, can it be used along with SeaChem prime (ammonia neutralizer) that I have been using jn tank transfer process to ward off ammonia. Articles pertain to that of copper and prime, but nothing with formalin. First, a thanks for all the wealth of knowledge you and your team have provided! I have also read the "Contentious Marine Aquarist" book which was very valuable. I know that formalin (formaldehyde) and Methylene blue are recommended for FW dips, and that malachite green is not. However, here in Canada I cannot get my hands on any formalin. I can, however, get pure Methylene blue. There is one product that contains formalin, Rid-Ich+, but it is mixed with malachite green. It claims it "utilizes the less common but also less toxic chloride salt of malachite green", but I'm not sure if that will really make it less harmful. Perhaps its best not to trust it at all? The other product with formalin is a little 2 sided sachet from Blue Life called "Safety Stop". It produces 30 ~ 60 min baths. One side is Methylene blue, and the other is formalin. The ingredients say only those two things, but the formalin side has a green colour, so perhaps has malachite green? I'm not sure on that, but perhaps it was just colouring to make the dip clearly visible. Question: how would you proceed to do FW dips? Is Methylene blue plus fresh water sufficient to remove parasites like Brooklynella? Or should I try the sachet of formalin. It looks like its only a few ml, so would that even be strong enough for a 10 min FW dip, when its meant for 30 ~ 60 min.s of exposure? I'm asking, because I want to do the transfer-tank-method (TTM) to remove what I suspected was Brooklynella. My two clownfish died, and I have a coral beauty and a blue-green Chromis left that seem totally fine. The plan was to leave the display tank fallow for 2 months, and do this TTM on these two remaining fish before they enter the quarantine tank. P.S. Sorry for the huge wall of text above. Thanks for the quick response. Cheers! Thank you so much for providing such an excellent service to the hobby! I have been battling marine ich for quite some time. It turns out that the quarantine tank was still infested despite going fallow for 5 weeks and leaving the specific gravity at 1.012. I have thus torn it down and cleaned with bleach. It's back up and running. In the meantime, I have stuck with freshwater dipping all in-coming fish with formalin. Some have been tolerating it more then others. while a Red-headed Salon Wrasse went limp as soon it entered the bath (normal for this species?). I used common sense and skipped the bath. I just wanted to see if you would/would not recommend dipping the following species with or without formalin. And finally, is freshwater/formalin dipping a general treatment for all marine fish or are there certain species that it should not be performed on? It would be ironic if the fish that we are trying to help are actually being damaged! It's in SoCal already, probably in my hot little hands tomorrow night. but the thing that sticks in my mind is that, just like copper - I'm sticking my fish into poison in the theory that the fish are more resilient than the bugs. In that case, just like copper, isn't the dose of formalin critical? And assuming it is -- I never thought to ask anyone ... is the 250ppm desired - the dose of Formalin? Or of the already diluted Formaldehyde? Or am I over-thinking? And, I guess, finally .... if the fish survive the first two hours after the dip then we assume they withstood it and go on a two week watch before sale? I know that from a commercial standpoint "they" are going to say "if it acts normally and eats for 48 hours ..."
Greetings, We had an outbreak of Ich/crypt in a 55 gallon grow out tank. As a result, we ended up attempting to use AP formalin. 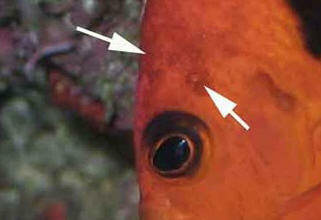 The only fish were a juvenile bigeye soldierfish and a juvenile Gymnothorax fimbriatus. Since there is an eel in the tank I ruled out copper treatments, and used the formalin on the tank at less than the recommended dose. The manufacturer stated two drops per gallon, but concern for the eel led me to use only one per gallon. There were numerous errors made here by me in administrating the med, such as the fact that the substrate is crushed coral. I only added the initial dose as stated above, but did not add any more formalin. A few days later I changed about 50% of water. This tank had some old Whisper 60 HOB filters, so I added in some carbon into the cartridges in an attempt to remove the formalin. Anyway, my concern ironically enough is what else do I need to do to remove all the formalin from the system as it is such a toxic chemical. I'm actually more concerned about effects the formalin might have on my fish even after water change and adding carbon, And whether I should be concerned about health effects for me or anyone else who touches the water during maintenance, etc. Thanks for the help, and pardon the long message with a dose of hypochondria. <You're playing w/ fire... smoke on the water. Read, understand, then act. I have a customer who want to have an aquarium in her class of Biology but sometime they work with Formol (you know, the product they use to preserve dead animal ) do you know if the vapor of this product can be dangerous for the fishes and invertebrates? recommends 20 drops per gallons as a dip solution. I noticed in the Conscientious Aquarists the recommendation of 1 ounce per 5 gallons. I realize converting drops to ounces is a bit difficult but it seems it are about 20 to 25 drops per ml. 1 ounce is about 30 ml and there are about 25 drops in a ml, therefore about 750 drops per ounce (some sources say upward of a 1000).....that divided by 5 is about 150 drops per gallon. ..........is my math (or research) that bad?? Again, thank your for your thoughtful and thought provoking reply. 1. Salinity at 15 ppt, I don't know why but I have trouble getting it down to 14! I think it is likely due to me being "chicken" in fear of overshooting. I will try with another 40 gallon water change tomorrow. 2. pH 7.94. I just got my pH monitor and wow, it makes things so easy which allows me to be more comfortable adjusting pH with Seachem's Marine Buffer. I'm working on raising it by 0.1 per day. Evaporation will be compensated by my ATO with pH adjusted fresh DI water at pH 8.2. - which means, as I keep them in hypo, there should not be "new" infections. Can I do a continuous bath with formalin while they are in hypo? Why am I thinking about this? I want something that would not only kill the Theronts and Trophonts swimming about the tank but the Trophonts attached to my fish that are feeding "nearer" the surface of the fishes skin. My friend at the LFS (a great fan of formalin) suggested that it could be done as the formalin will evaporate out of solution over a day or two. I've read at WWM that formalin can be used in a freshwater dip of 5 minutes, or salt water bath of up to 60 minutes. I don't think that anyone has been "crazy" enough to propose something like this. What are your thoughts? <I have, and do use formalin on a regular basis for both short and long immersion of fishes in dips/ baths only, but I never add it to a system, hospital or otherwise. It can be used either a short (5 min) dip or prolonged (45 min) bath. Have a look on WWM re: http://www.wetwebmedia.com/formalinfaqs.htm>. If I do this. I will dose at 3/4 the "normal" suggested dose of "1 ml of the 37% stock solution for every 25 gallons of quarantine tank water" so that would be 6 ml for my 200 gallons of water since I'm in hypo. Theoretically speaking, I think I should be able to dose at full strength at 8 ml since my sand and rocks would "absorb" some of the formalin...Maybe? I can't tell you how much I appreciate your thoughts! I run a 150g quarantine system (three 40g tanks with a 30g sump with skimmer and 36 watt UV sterilizer. Parametres are: SG 1.025, PH 8.3, Temp 78, Ammonia 0, Nitrate 0.
and the rock in his QT isn't going to give him much more to eat. He does accept algae pellets and Mysis, so he's not starving, but normally my inclination would be to quarantine a fish for a month from the last time it showed any signs of disease. This would, however, put him in the QT for 6 weeks total, which seems like a lot of stress. Would you consider a Chevron Tang a candidate for early release into the display, or should I run the full course of quarantine? I don't want to overstress the fish, but neither do I want to introduce Ich into a thus far (7 years) Ich free system (200g display, 100g refugium, 60g seahorse/pipefish tank, 200g sump). formalin to the water for the FW dip? whereas a FW dip I do for 5-10. I just want to be absolutely clear that I'm understanding you here. Normal formalin dose (I use 2tsp/gallon of Formalin 3) in ph/temp adjusted freshwater, airstone, 5-10 minutes? Greetings to Bob and Crew at WWM! I hope that all is well with each and every one at WWM. I recently shared my experience with you regarding a nasty bout of C. irritans and Quinine Sulfate and received much helpful advice - thank you! Sadly though, my battle continues due to my own stupidity. Now looking back at things, I could only shake my head and ask myself "what in the world were you thinking?" In order to recap a little and to remind Bob which sorry soul I am, I will quickly give a synopsis of events. I have a 225 gallon reef tank with Powder blue tang, Kole tang, Atlantic blue tang, Flame angel, three wrasses (Clown Fairy, Exquisite, and Cleaner). all my fish and started quinine sulfate treatment in a 55 gallon hospital tank. I was without C. irritans for two weeks after the 10 day treatment and decided that this would be a wonderful opportunity to try to introduce an Achilles tang which was at the LFS for five weeks and looking absolutely stunning. I introduced him to my fishes while they were all in "quarantine"
as I was waiting for my reef tank to go fallow for a total of six weeks. 10 days before introducing them back to the DT which was fallow for FIVE weeks. I did it one week early because all fishes were starting to show signs of stress from being in a less than adequate environment. Four days later, I noticed bumps on the Powder blue tang. I called my LFS and spoke with my buddy and owner of the LFS who recommended me to do something slightly on the drastic side and this is where I like to share my experience and ask some questions. I was guessing that the strain of C. irritans I have now is resistant to quinine sulfate as I wrote to National Fish Pharmacy and Dr. Brian Aukes suggested it be so. I was leaving to the Maldives in SIX days when all this was occurring and my pet sitter is limited in her ability to handle copper treatment. So my buddy, John, offered his experience of being in the fish trade and help - Formaldehyde. I took all my corals, macro algae, most of my snails and hermits out and distributed them in the multitude of tanks I have at the house. He took my corals to the LFS for safe keeping. Now, I have, essentially a FOWLR tank. We figured with the sump and refugium, there are 250 gallons of water. So we dosed 25 ml of 37% Formaldehyde solution directly into the DT. I thought my heart was going to stop but it didn't. I dosed another 25 ml on day three. The fishes were actually doing better, showing more color and feeding better. I did a third dose of 30 ml Formalin solution 36 hours before I left and a 40 gallon water change 24 hours after it. At that time, there were still spots of ich on the all the tangs. Three days later, a fourth dose of 25 ml was given, which was followed by TWO 30 ml treatments four days apart. During that time, according to John, my parameters stayed "acceptable". - Formalin in DT - is something that is not done nor recommended, but at this time, it appears as the only thing I can do to keep the ich in check. 1. At 40 ml to 250 gallons, the concentration greatly exceeds the 1 drop per gallon or 1 ml per 25 gallon recommended by WWM for continuous bath. I know I'm probably doing damage to my fishes' internal organs like their liver... What can I do to reverse that damage or things I should be watching out for? 2. What type of ich is so resistant to treatment? These guys have been through so much - fresh water dips of 7 minutes, hypo saline conditions, quinine sulfate, and now continuous formalin! How much formalin can ich stand? 3. I've learned from WWM about the life cycle of C. irritans. Ich on fish is protected against treatment, they drop off of fish in 3-7 days during which they are resistant also? They divide while attached to my substrate and only when they hatch is when they are susceptible to treatment. I feel like I should be dosing formalin DAILY for 28 days but KNOW THAT I CANNOT DO THIS, so I'm thinking I should be able to catch into the cycle with 5 treatments every third or fourth day? I also know to dose at night as the C. irritans hatch at night and hunt while the fishes are sleeping. 4. I am surprised to see all my fishes alive and active. I just don't know how long they can withstand this. I'm sure you have many thoughts going through your mind as you read this. As always, I really appreciate the help and advise that is given! It took me two days to ponder what you wrote while staring at my fishes to "comprehend" what you recommend! You are recommending that I move my fishes out of my infected system because as long as one tomont exists and encysts in my tank, I've got 200+ theronts looking for my tangs to attach. My system is established by C. irritans that I most likely have fresh theronts everyday, so even treating with formalin every three days will not kill them fast enough. I see now that this is why formalin works so well in a retail setting where there are minimal things for the tomonts to attach and not work well for the home aquarium where the tank is set up with rocks and sand. This really has been a learning experience! I have been battling with ich since November and reading almost daily regarding ich and it's treatments. I've learned a lot from everyone, especially WWM and Mr. Fenner, and I'm continuing to find new and interesting information daily. To catch up since the last e-mail. I did not take the fishes out and put them in quarantine. I decided not to do so for two reasons. One reason is that my quarantine is 55 gallons and is truly small for all my fish who are in a 225 gallon tank for the 6 week they would be for treatment and letting the DT go fallow. Secondly, I really wanted to treat my whole tank too. After reading Bob's e-mail and about different formalin dosing schedules, I thought I would give a slight increased dose and increased dosing schedule a try for a few days and see what happens as I've pretty much already destroyed my bio-filter in my system. it on the Atlantic Blue. I started dosing 37 mL of formalin every 48 hours. My sixth treatment was last pm. I do 40 gallons of water change prior to every other dosing, so around every four days. So far, all my fishes are alive and eating well and it appears that the ich is subsiding. Not gone by any means but I notice fewer and fewer, smaller and smaller bumps on the tangs. The few surprises are that I spotted the peppermint shrimp in my tank who I've written off as dead for several weeks, my Zoanthids are actually opening, I've seen a few feather duster worms still hanging on, and found one hermit crab that I missed when I removed everyone else. 1. Is this ich? Why am I asking this question? 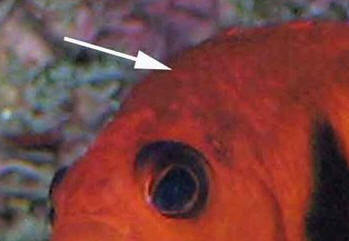 Well, in my search for information today, I saw a picture of a fish with "severe ich". It looked like a fish that has been salted all over. I've enclosed a few pictures of my tangs and well...it looks like ich (at least what I thought) but much smaller than what I saw in the picture. 2. If this round of formalin does work and rid the ich, how long would you continue to treat the DT? Would you really treat it for 28 days AFTER the last bump on the fish to make sure that all theronts are killed? 3. What is the evaporation rate of formalin in salt water at 80 degrees? it by 50% to 37 ML, dosed at every 48 hours appears to have an effect on the frequency of "new" bumps seen on the tangs. I was thinking of increasing the frequency to a lesser dose daily like 25 mL so to kill all the theronts excysted in one 24 hour period but was afraid that I may be dosing too frequently as to have a build up of formalin in my tank. Example day one 25 mL, two 37.5 mL, three 46.5 ML (going along the theories of half lives). <Dear... you will almost assuredly kill all/everything, yes, including your fishes... continuing with this methodology. What's more, formalin is too toxic for almost all hobbyists use... It is a biocide... kills all life. Thank you so much for your patience with me. I've been trying to figure this out by researching on WWM and on line and have not found much written regarding the half life of formalin. Thank you for your quick and thoughtful reply. Sorry about the large files for the pics...I had to use the Canon to make sure the "bumps" show. I would love to try something else as on many nights I would wake gasping for air thinking I'm the one being embalmed in formalin! I've tried so many different treatments: hyposalinity, fresh water baths lasting 5-8 minutes, and quinine sulfate. The quinine sulfate from National Fish Pharmacy worked for my original ich but not this protozoan parasite as my tang caught this from an Achilles Tang that was being quarantined. This is definitely much smaller and "tighter" than regular ich. What do you think it is? With all your new information, especially now you know what my parasite looks like and is not your normal C. irritans, here are some thoughts of possible treatments: Which one would you do, any or none of them? What other possible treatments am I missing? 3. Huge water change, put the carbon, poly floss, Purigen back in it. Wait a day to make sure that all formalin is "gone" where ever it goes. Get maybe 3 cleaner shrimps and see if they will eat the parasites off the fishes? 4. Increase the dose of quinine sulfate by 50% of recommended? I will also start looking for any protozoan treatments available, not only for C. irritans. Sorry, but I had forgotten to add Chloroquine Phosphate to the list of possibilities. I remember reading it on WWM just now a long time ago. Greetings Bob and crew at WWM. After reading your e-mail and contacting Dr. Aukes from National Fish Pharmacy. I re-thought my past treatment with quinine sulfate and more recently with formalin and realized that I am the reason neither medications worked. This led me to acknowledge the need to share my experience so that others may learn from my mistakes. Going back several months ago, after the quinine sulfate did not APPEAR to work in treating the C. irritans infection brought by the Achilles tang. 1) The Achilles was not eating in the quarantine and the only fish showing ich. No good nutrition intake leading to the poor immunity of the fish to begin with. 2) By the 8th week for all my fishes to be in a 55 gallon not previously cycled hospital tank, they were starting to show a lot of stress: flame angel exhibited darkening of facial markings like a red mustache, my wrasses hovering near the surface and loosing their appetite and looking like a film was covering their usually brilliant colors. Stress due to daily fluctuation of ammonia, nitrate, nitrite, and not to mention the daily 20+ gallon water changes. Stress leading to poor immunity. 3) I was pressured for time as I was going on holiday for two and a half weeks. My stress, causing me behave more erratically and making bad decisions. Loosing patience and losing sight of what exactly what I was supposed to be doing. magic ball Mr. Fenner! I stupidly left my protein skimmer ON! I was cleaning it every other day and still not recognizing I should have turned it off. That was why I was not killing ANYTHING! information on whether quinine will be absorbed or bound by substrate. Dr. Aukes from NFP said NO. I've turned off my UV sterilizer and my protein skimmer and I will do as told by Dr. Aukes - Treat once and leave in for 7 days. No parameter testing, water condition will be told by fish behavior. I did note to Dr. Aukes that all my fishes' appetite have decreased since starting treatment and that they are seem more shy and even a little grumpy. He advised that this is often observed and will continue as they are in treatment. I also asked if I need to re dose every seven days for a total of 28 days for the life cycle of C. irritans and he said no - just one treatment. of the woods yet, but I will keep my fingers crossed and keep following the advise of those wiser and more experienced. Thank you Bob, for putting up with my endless e-mails and also to have the patience to point things out to me, even if I miss the "point" several times in a row. I hope to share good news with you in a few weeks...before I go to the Great Barrier Reef. for 24 hours. It cured the ick outbreak on both fish and the damsel was fine. However, the solution dissolved Tweety's pectoral, ventral, and dorsal fins. the rays look funny and the membrane is missing to about half way down. He seems to be feeling ok now. He is eating and swimming in a normal manner, but his fins look awful. Will they repair themselves, or is he a lost cause? He is my favorite fish and I don't won't to give up on him, but I don't want him to poison my tank, either.